There’s a beautiful little house in Oakland, California - on a main road, up a set of short, steep stairs and past a little white latched gate. It contains an American, in the truest sense of the word. Nik Sharma's is one of the classic emigrant stories. Move abroad, study well, work hard, attain success in a respected field. 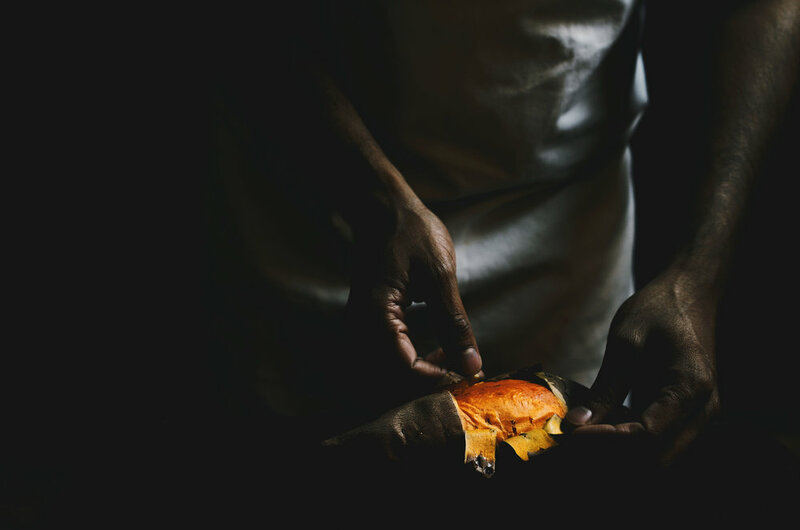 But while working towards his version of the American dream, Nik turned to cooking as an outlet for creative expression (and decompression) - and it turned out to be food all along. “When you live in a different country, you want to connect with what you’re familiar, but also explore what’s in front of you,” Nik says, sitting at his dining table in his bright, East Bay home. "I realized I was doing that through food. I was cooking dinner for friends, infusing flavors from home into what I was learning and experiencing culturally in America, mixing and mashing with what I tasted and knew growing up." A couple years ago, he found himself interning at a pastry shop in Sunnyvale, California, for minimum wage, in the early hours before his day job - a move purely driven by passion and interest. 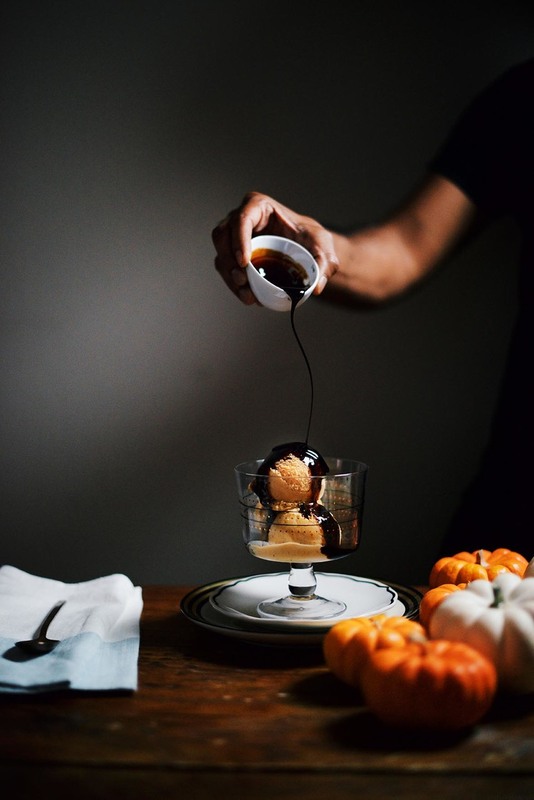 Now he’s full on in the food world as the creator of A Brown Table, a celebrated blog that’s seen recognition and awards from Saveur and others. And he’s busy photographing and curating new recipes for a cookbook, titled Season, coming out before the end of the year. Nik's recipes are vivid and textured beyond their ingredients, with ever-present references to India and her innumerable cuisines. They seem to reflect the layers one takes on as an immigrant - a few degrees removed, displaced, apart, while being deeply informed and aware, finding a home someway somehow. 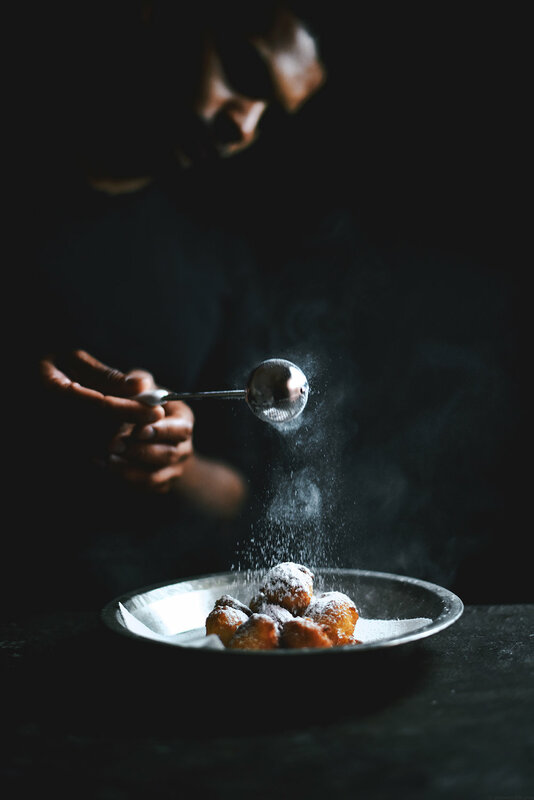 Cooking through his site, for me (an Indian-Malaysian-American immigrant and emigrant), brings certain feelings of peace, connection and recognition. In a Western food world dominated by white faces, Nik Sharma is a breath of representative fresh air. 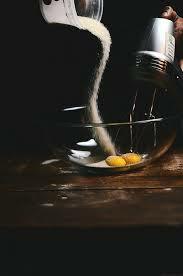 His food, his photographs, his stories - they're like coming home. At home one evening in Jakarta, I pulled up his recipe for Slow Cooker Goan Chicken Coconut Curry, a subtle, beautifully forgiving stew lashed with bright kashmiri chilis, coriander and ginger root. 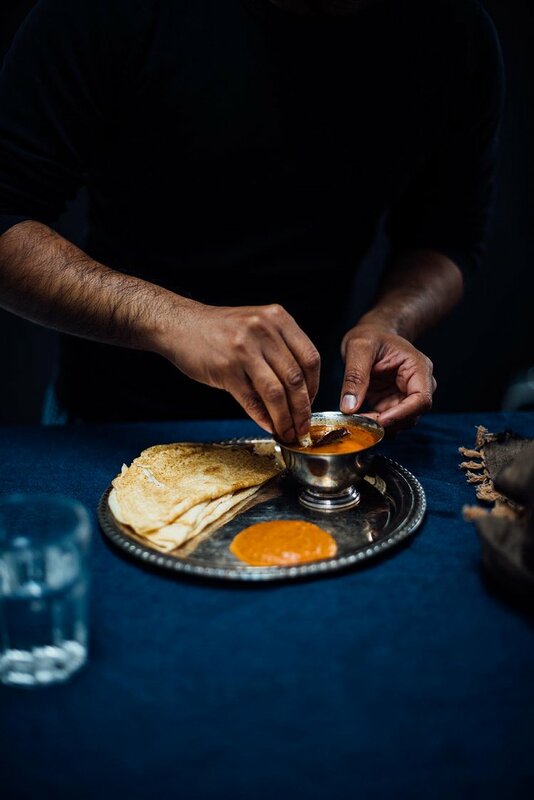 While he's stripped the process down a bit for non-expert Indian cooks, Nik doesn't let you shy away from the process of tempering aromatic spices over a medium flame, grinding them to release their scents and oils and cooking them slowly over low heat. It's an old process, inspired by his grandmother and made new, light, understandable and accessible. There's more of a complexity and blend of new and old to many of his other recipes (see his Seared Paneer with Tea and Pineapple Dressing, Spiced Kefir Fried Chicken, Tahitian Vanilla Bean and Tellicherry Black Pepper Jam Cake). But five hours later this one tasted like family and comfort, and I tasted - and appreciated - his mission. Nik’s movements through the US (and India) were punctuated by food. He grew up in Bombay, with a north Indian Hindu father and a Catholic mother from Goa, in the west. "We ate everything - food from the north, the west, the south - and my palate developed," he says. After arriving to the US at age 19 (Cincinnati), he studied molecular genetics, then public health policy at Georgetown. While on an upswing in his career in DC, he started a cooking blog that faded - but then picked back up upon his move to California with his now husband. Ghee, for example, is not clarified butter. he says. It’s ghee. You can’t call Indian cilantro chutney a pesto, because it’s not - there are no pine nuts or oil. If it’s a chutney, he says, let’s call it a chutney. Platforms, he says, have become increasingly important to him. He’s looking to use his in quiet but direct ways. “There aren’t too many Indian people who are [publicly] out,” he says. “That was one of my missions from this past year, to be more vocal about who I am. When I came out there was no one for me to reach out to or talk to.” He’s hoping to be someone people can come to, in or out of the food industry. I wonder if coming out publicly has influenced his cooking, or his photography - which is particularly breathtaking (he picked up a camera a few years back, knowing he needed to better illustrate his blog, and is completely self taught). I'm interested in his now home base, and how that effects his process. “Oakland is one of the most racially diverse cities in the country right now. But it’s also a place that I feel, having lived in so many different places, this is one of the cities that immediately accepted and welcomed me. Which was a very different experience,” he says. It’s a place where chefs can come, with a real sense of community, to experiment and innovate and exchange ideas. He points to Preeti Mistry (and her Juhu Beach Club) and Bryant Terry (with his wildly popular Afro-Vegan cookbook) as examples. Oakland has become a - and more to the point, his - learning lab for interesting cooks. For Nik, there’s no restaurant, but his outlets include a blog and a bi-monthly column in the San Francisco Chronicle - and now this book, Season. The 300 page cookbook is due to be released in the US, Canada and Europe. The fight goes on - alongside many others - but it remains rare to have representation of South Asians in culture and art in the west. I tell Nik it feels like going home, finding people who look like you, who tell stories you can feel in your bones, doing this kind of work. He’s building spaces where people can come and claim and see their identity, strongly. So he keeps working away, taking up space in delicious and brown ways. His latest endeavor is ABT Suppers - which he launched this year in partnership with West Elm. The backyard dinner parties raise money for local causes, like the ACLU. “Asha’s from Atlanta and was just nominated for James Beard. "He’s been a great friend, his work is groundbreaking and inspiring, and he’s from Oakland." “John lives in Oakland, he’s writing forward to my book and he’s a phenomenal food writer.